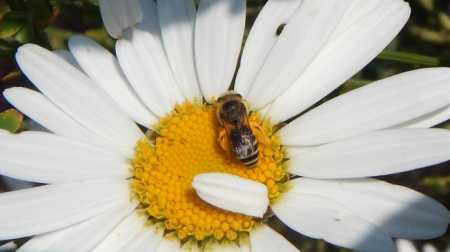 This lovely Davies’ colletes – (Colletes daviesanus) was busy foraging on the oxeye daisies in my garden last summer. They typically appear in spring, and can be seen through to September in the UK. Davies’ colletes gather pollen from a range of composite flowers - such as these oxeye daisies in my garden, and wildflowers typically seen on flowery verges and wild brownfield sites, such as ragworts, yarrow, tansy, common fleabane, mayweeds and chamomiles. 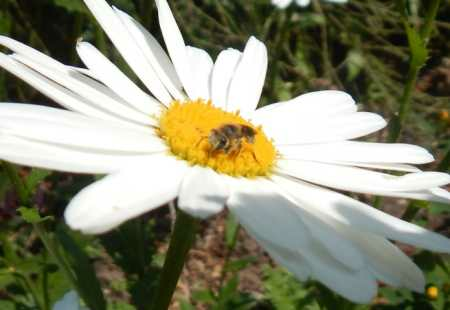 However, they will forage for nectar from a wider range of flowers, including garden flowers, to gather nectar. Above - Colletes species like this one - Colletes daviesanus could be confused with the honey bee, Apis mellifera pictured right. However, the markings of the Colletes species above are brighter. 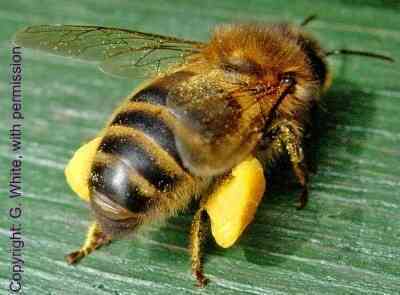 Also, note the amount of pollen on the hind legs. The pollen collecting mechanisms for the Colletes species pictured left, versus the honey bee pictured above, are different. The honey bee clearly collects and transports pollen in neat pollen baskets (corbiculae) on the hind legs, whereas the Colletes species carry pollen on hairs (scopa) on the legs. Females range from around 6.5 - 7mm with males slightly smaller from about 5.5 - 6.5mm - actually making them slightly smaller than the Western honey bee. 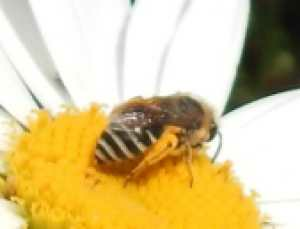 Above: Note tuft of hair on the face of the female Davies' Colletes. I have repeatedly seen on social media the mention that if a bee has much hair (a tuft or 'moustache') on the front of its face, it is a male. However, this is not always the case, and can be misleading. The female of this species clearly has quite a lot of tufty hair on its face! Where Do Davies' Colletes build Their Nests? Davies' colletes may nest in large groups in dry soils and south facing slopes, or may nest in walls in soft mortar or sandstone. When creating nest cells, these bees secrete a cellophane like substance from the abdomen with which they line and glue their nest cells. This substance is not only waterproof, it protects the nest cells and its contents from harmful fungi.